Our team (When Mum’s Go Wild) came together for the first Spirited Women race in Rotorua after seeing a post about the race on Facebook. I was looking for a challenge to get me motivated and fitter and this looked perfect. My neighbour was keen, and she roped in her sister-in-law and another friend. My only stipulation was that they weren’t too competitive!! As at that point I couldn’t even run one kilometre. It turns out we are all quite competitive, so after thoroughly enjoying the short course in Rotorua and finishing a very surprised 4th in the Veteran category, we decided to increase to the Medium and train a bit harder, as well as learning how to navigate. A scary start in the dark, cycling down paddocks in the fog and about 50 km of mountain biking in Taupo, made for an exciting race. We thought we were at the back of the field because we had hardly seen anyone else on the course until someone told us at a transition that we were the second team through, which gave our tired legs an instant boost. We managed first place in our category that year. This year in Ohope, the hills were a killer, but the scenery, the ocean kayak and the chance to try target shooting and a massive waterslide made us want to do it all again in Gisborne (Of course 2nd place helped with the motivation as well). This year, however, I want to give back some of the benefits that Spirited Women has given me. I am currently a Pinc and Steel programme physiotherapist. In my work with my Pinc and Steel clients, I have seen the benefit that they get from the programmes. Whether it be being able to get through the day at work, moving into sports and activity again, or in one case just being able to go back to school and last the whole day. It is a pleasure to be able to guide people positively through their cancer recovery. However, we need more funding so more people can access the programme. So, I am hoping that many more of you superwomen out there will take up the challenge and get some fundraising for the Pinc and Steel Rehabilitation Trust. Or if you don’t want to fundraise, let people know about the trust and the work they do and donate. I am also doing this for all the people close to me who have been diagnosed with cancer in the last few years. It is super easy to set up a fundraising page and begin raising funds for the cause. 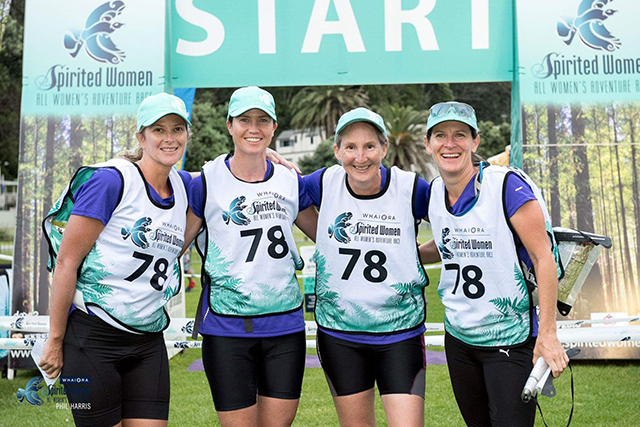 Together with your Spirited Women Team mates, you can make a big difference for New Zealanders affected by cancer. Just click here. 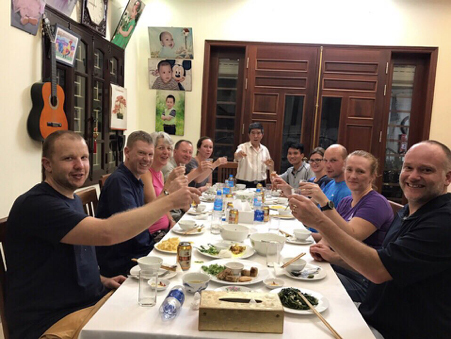 It all started with a phone call on the 16th April 2018 from Heather – I had won the spot prize – a Bike Vietnam tour with World Expeditions! Right off, my wonderful aunty said she would look after the kids and that I should take my husband Simon for this once in a life time trip. We then hopped on our connecting flight to Hanoi where we were meet by a lovely staff member who took us to our hotel. After a rushed check in, straight into the briefing where we met Tim our Tour Guide and the 7 others who we would share the next 15 days with for this wild ride. Next was off to the Water puppet show, then dinner at a local home. This family was so charming and it was lovely to be taken into their home and share the evening with them. Day 1, was cycling around Hanoi which ended up being 50km, not the 20-30km trip we were all lead to believe and understandably by the end of the trip we knew that when Tim gave us a time or distance we double it and “level” meant going up hills. Then off to Ha Long Bay for our overnight boat trip in one of the Seven Wonders of the World. When we hop onto our tender out to the boat which we would call home for the night we were told some bad news from the General Manager of the boating company. Seems our boat had lost power and we were not able to use that ship. The good news was we received an upgraded from 3 star to 5 star. No complaint here as it was a beautiful boat. Ha Long Bay delivers, with the beautiful landscape it took my breath away. It is so serene, peaceful and untouched, what an amazing place and so glad we visited here to see this beautiful slice of Vietnam. The floating village was amazing, to see how they live and their life style yet so hard at the same time. It was sad to leave this place of beauty. But we had a drive ahead of us and of course more cycling. We cycled to Ninh Binh and boarded a Sampan for a journey though the mountains of Trang An. Very glad our guide took us here early in the morning when no-one was there as we could experience the peacefulness of the place. We then experienced the Train from Ninh Binh to Hue. Wow what an experience I have to say. Definitely not what we are used to back home. At the train station an 11 year old girl come up to my husband to practice her English and I couldn’t fault her at all. We showed her pictures of NZ and talked about how different NZ and Vietnam were for children. Hue was another beautiful city and again not enough time to explore the city fully but what we saw was amazing. Ho An was a beautiful and people so friendly, markets where lovely to walk though even though people seem to grab you from all directions to buy from their stalls, there was just so much to take in. We had the pleasure of having two days here which was nice as the lantern festive was on. It was amazing walking around at night with all the lanterns lit up. We left to cycle to Quang Ngai and most of our group tackled the 500m high hill with many 10% graded hills. This took about 2 hours to get to the top. My hubby being one of them and so proud of him as I had just about passed out from the heat earlier that day so thought it was best I hopped on the bus for this trip. 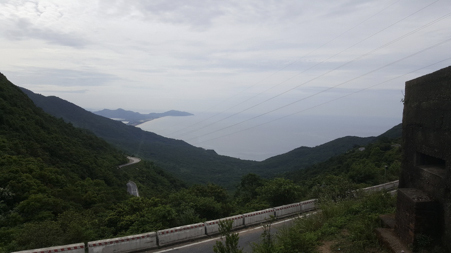 The trip started at the beach between the peninsular and hill finishing with the view from the top between the North and South of Vietnam. From this point we headed into Central Vietnam – spent 2 days of cycling past some old French villas, that are huge, beautiful and being restored to their former glory. The French love this area as not too hot in summer. 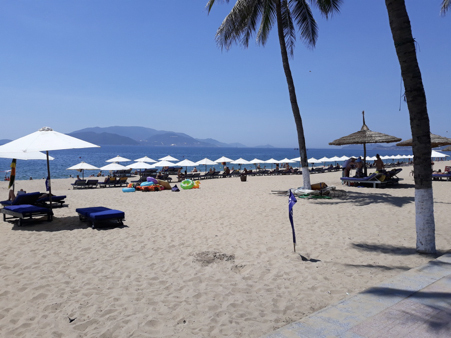 Travelling south to Nha Trang is a busy beach city with lots of tourists and major development happening. There are stunning beaches, amazing scenery, loads of shrimp farms and seafood for seafood lovers. On the way out to the airport there was about 8 miles of resorts being built and developed. So glad we got to see this place before all this growth happens as I feel it will take away the natural beauty of this city. Next we flew to Ho Chi Minh City and wow 16 million people, it was so busy with more cars than any other city we had visited. The next morning we were off again on the bus to meet up with the truck, collect our bikes to then cycle to Chu Chi Tunnels. This place was very surreal as there was a lot of Viet Cong activity in this area, underground tunnels which were amazing. How they hand cut out tunnels, networked them all to survive and living up to 9 metres below ground. Hubby went into the tunnels and couldn’t fit through even being on his hands and knees. We had a great night for our farewell group dinner yet also sad as we had meet some wonderful people along with our trip guide Tim who we loved to rib all the time. These people who at the start we didn’t know from a bar of soap to making great friends and making the trip what it was. Thank you World Expeditions and Whaiora Spirted Women Adventure Race for this once in a life time experience that has deeply touched my hubby and I, we honestly hope to be able to go back and explore more of Vietnam one day with our family. To view the latest enews, go to spiritedwomennews.co.nz.